Today G got to go to the splash pad/pool with a group of kids from daycare. I got a text from the daycare this evening that she heard from another parent that G was causing trouble while they were there. I guess that G was pushing his friend's head under water and other roughhousing that was not appropriate. 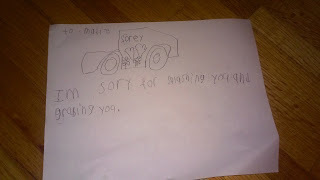 We made our way back to daycare after everyone else had left and apologised for causing trouble and decided that "I'm sorry notes" needed to written to this girl, her mom, and her brother because it bothered him enough to tell his mom about what happened. She didn't want to tell because G is her friend and she didn't want to get him into trouble. 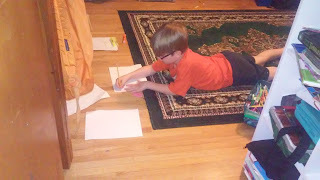 G wrote and colored his cards this evening by himself in his room. 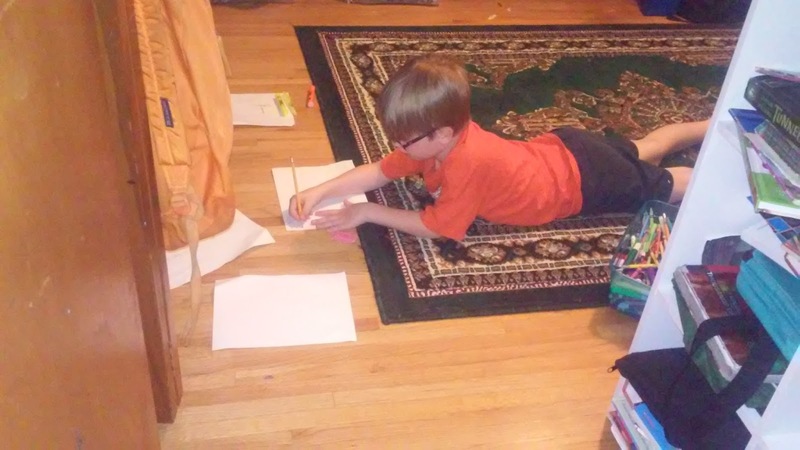 I told him that every time that he hurts a girl he needs to make her a card or do something else special for her. I also told him that girls like hearts and flowers so he drew her a truck with hearts and flowers on it lol. I am glad that he learned his lesson and will realize that things like that are not ok to do.